Trees protect our climate, are home to many animal and plant species and a source of life for all of us. Forests are the green heart of our Earth and it has to be preserved at any cost. With a tree parentship you can support the protection of the environment, the climate and naturedirectly by reafforestation! Thanks to your parentship destroyed forests will get the breath of new life. Hence, you do not only support conservation and the preservation of the biodiversity, but you also help to reduce CO2 inthe atmosphere and to protect our climate. You can directly support ecology and conservation of nature by planting new forests fostering a tree! This fostering breathes new life into devastated forests. In fact, you do not only support ecology and the preservation of biodiversity, but you also help filtering CO2 out of the atmosphere and protecting our climate. Our foster tree concept is a fancy gift idea which is going to be remembered a whole lifetime. No matter if it is for Christmas, a birthday, a baptism, a birth or just without specific reason: a real piece of nature is a very good idea for a gift. Our foster tree concept is a fancy gift idea which is going to be remembered a whole lifetime. No matter if it is for Christmas, a birthday, a baptism, a birth or just without specific reason: a real piece of nature is a very good idea for a present. Yes, I contribute to the global reafforestation against climate change and plant trees now. At the same time I secure jobs and save lives with each planted tree. (depending on choice non-recurring. monthly, quarterly, half-yearly, yearly). 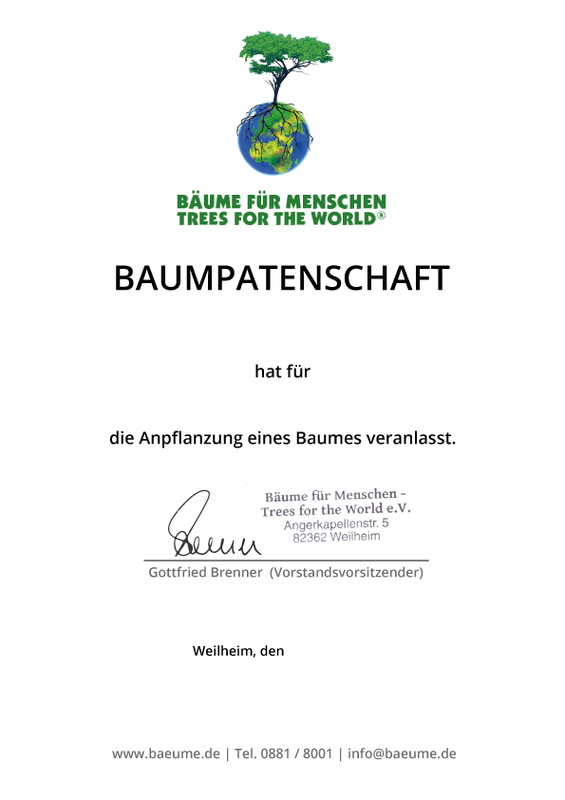 You can deduct all donations to Bäume für Menschen - Trees for the World e.V. for tax purposes. Normally, the paying-in slip of the bank applies as the receipt for tax purposes for donations up to 200 EUR, provided the donation has been declared as such. If you need an additional receipt for tax purpose and you want to receive it by post, please fill in the following fields.